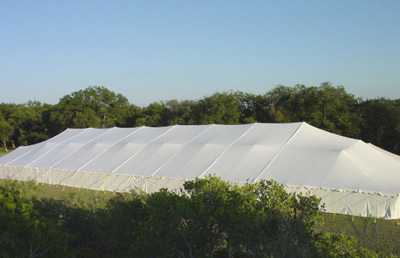 This fully-functional tent kit is built to endure multiple set-ups and take-downs for commercial and industrial use. It has heavy-duty 'block out' vinyl topping that comes in solid white, or white with red, blue, green or yellow vertical striping. Two-inch seatbelt webbing reinforces the entire perimeter for extra durability. The center and quarter poles each have a plate welded on the top and bottom with a heavy-duty pin welded into the top. Stakes, storage bag, and installation video make this Ohenry tent the top of the line for installation and storage. It comes with a 1-year warranty.